Three Card Brag is a card game with a rich history dating back to the 16th Century. It’s widely considered to be the first British card game to use the concept of “bluffing,” thus paving the way for the poker variants we know and love today. We cover the rules of Three Card Brag and explain how to play this entertaining game for real money bets. Three Card Brag is a popular game played among friends. Three Card Brag is played with a standard deck of 52 playing cards, excluding jokers. It is best played with four to eight players, although it can be played with as little as two players. Cards are only shuffled once at the start of the game, or after a winning Prial hand (Pair Royal). Each game round lasts approximately five to 10 minutes. The aim of Three Card Brag is to get the best three card hand possible, beating all other players – although you also have the option of bluffing (“bragging”). Bluffing means you can lie about the value of your hand in a bid to deceive other players in the hopes they’ll believe you have a stronger hand than theirs and fold out of the game. The value of the initial ante bet must be established before gameplay commences, along with the minimum and maximum amount of the initial bet and a limit on the amount that a bet can be increased by each subsequent player. Ante bets are placed by all players. The dealer now deals three face-down cards to each player, one at a time. Players look at their cards, not revealing their hand to anyone else. Anyone choosing to play blind can now do so (explained in further detail below). Betting now begins from the left of the dealer. Players have the choice to fold (forfeit their ante bet and eliminate themselves from the game) or bet, which requires any bet amount within the agreed minimum and maximum betting limits, provided it’s equal to the previous player’s bet or higher. If you can’t at least match the size of the bet before you, you must fold. Betting continues as many times around the group as necessary until only one or two players remain in the game. If all but one player folds, that player is the winner and takes the pot. If two players remain, a third betting option now becomes available, known as “see,” which costs double the amount of the previous bet. If you pay to see the other player’s cards, they must now reveal their three-card hand. If your hand is better, you need to prove it by showing it to the table. If your hand is worse or equal, you can fold without having to reveal your cards. In the event of a draw, the player who paid to “see” is the loser. After the initial three card hands have been dealt, players have the option of betting blind, which means you bet without looking at your cards. Choosing to play blind means each of your bets will cost half the amount of the standard non-blind bet. You can choose to look at your cards at any stage, however you will no longer be considered a blind player and will be subject to the standard betting amounts. If you’re playing blind and all other players fold, you don’t win the pot, but instead the pot carries over to the next game and you’re allowed to keep your current hand. When the next deal takes place, you can then decide whether to play with your new hand or keep your old one. 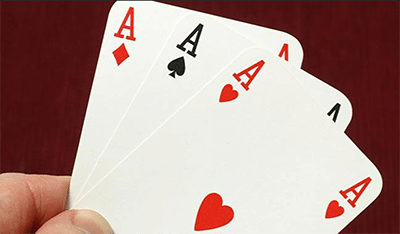 The best possible hand you can get is a Prial consisting of three threes (which comes with odds of 5,524 to 1), although all other Prial hands rank in regular order descending from three Aces to three twos. One of the odd factors of gameplay in Three Card Brag is that cards are rarely shuffled, and are instead simply placed at the bottom of the deck after each round. The only time cards are shuffled is at the beginning of the game and when a round is won with a Prial hand. This means technically, if you’re astute enough and familiar with the concept, card counting could be applied in Three Card Brag. While it’s unlikely players of this casual card game will bother with card counting, recommended Three Card Brag strategy suggests that players should embrace the concept of bluffing. Playing by the odds too rigidly is a sure way to lose quickly, and as bluffing is half the fun of this game, Three Card Brag is a great chance to work on your poker face. Playing blind should also only be done by experienced players. This is a difficult practice that takes a certain amount of expert knowledge to do well. If you do want to have a crack at betting blind, make it an occasional thing and ensure you’re financially prepared for the likely chance of losing. Note: Online gambling is illegal in Australia as of September 2017 following the introduction of the Interactive Gambling Amendment Bill 2016, so for Australians the content on this page is informational in nature only. The information below is for international readers only. Given the large variety of online card games available at our top-rated casinos, it’s unfortunate that Three Card Brag isn’t available to play at any of our recommended casinos. This is likely due to the fact that bluffing is an imperative part of the game, which just doesn’t translate properly over a computer screen. If you’re keen to play Three Card Brag, kick it old school and grab a deck of cards, round up some mates and see why this game has been so popular at social gatherings in Britain, India and Nepal for centuries. Alternatively, Three Card Brag is very similar to Three Card Poker, which is available in both RNG and live dealer formats at several of our recommended casinos. Play card game alternatives to Three Card Brag, like Three Card Poker or blackjack, at Guts Casino, where new players can claim a 100% matched deposit welcome bonus plus 100 free spins to use on selected slot games.